Author, playwright and lecturer Vance Bourjaily (1922-2010) lived in Ajijic during the summer of 1951. Bourjaily was born in Cleveland, Ohio, on 17 September 1922. Writing was in his blood: his father was a journalist and his mother wrote feature articles and romance novels. 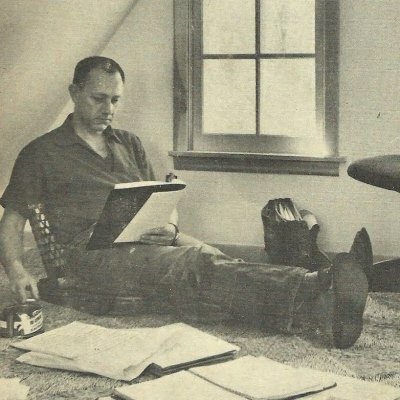 By the time he graduated from Bowdoin College in 1947, he had already been commissioned to write a novel about a young man coping with the experiences of war. This first novel, The End of My Life (1947), established Bourjaily’s reputation as a fine writer. Bourjaily’s later novels explored other great American themes, though none of them garnered the same degree of praise as his debut novel. Owing to the unauthorized and uncredited use of material from this post on a third-party website, the remainder of this article has been removed from public view.